There were cameos to pass dull parts easier. Red Skelton did a funny to Frank's deadpan reaction and was off within a minute, same with Shirley MacLaine and what looks like an ad-libbed drunk scene opposite Dean. More effective were drop-ins by faded names tossed a day's work for reasons lost to time. I'd guess George Raft and Hoot Gibson were greeting at some lounge/casino in town. Both had filled such position at one time or other. Raft was not long back from shaking hands at Cuban tables before lights went out there. 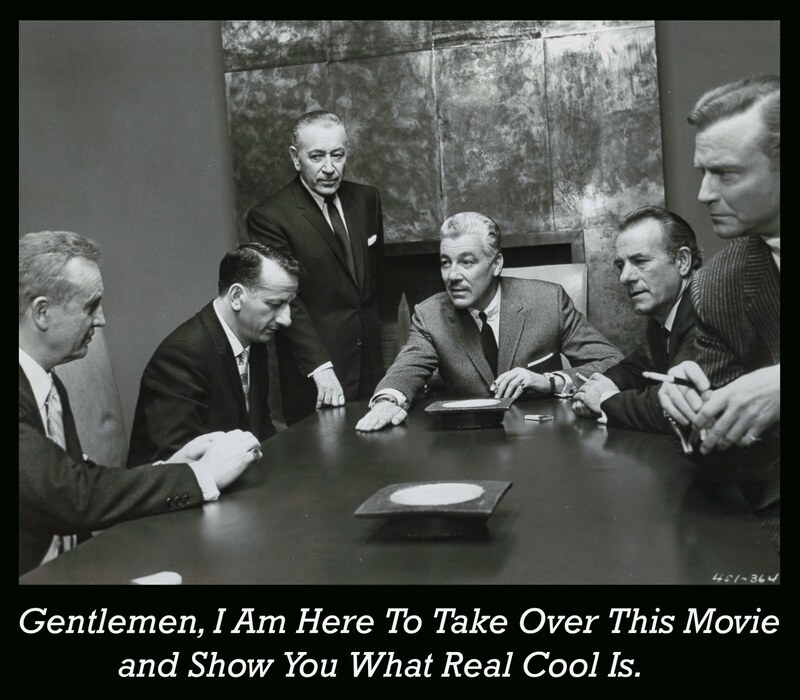 He lends gravitas to a post-robbery boardroom scene that's reasonably close, I suppose, to what might have gone on among Mafia chieftains should a real Vegas raid have taken place. Was gang-connected Raft too close to actuality of casino ownership for comfort? Guess Mobsters figured George for a late show relic too far past prime to suggest true crime, not unlike his back to the 20's racketeer in Some Like It Hot. Hoot was something else, a face dating to when Vegas was all sand. Who knows ... maybe he'd chased indians across that desert once. Anyway, he was there for viewers ancient enough to recognize him, up to and including Frank and Dino ... both may have sat in as boys on Hooter's silent shoot-em-ups. I'd love knowing just whose idea it was to give him a break on Ocean's 11. 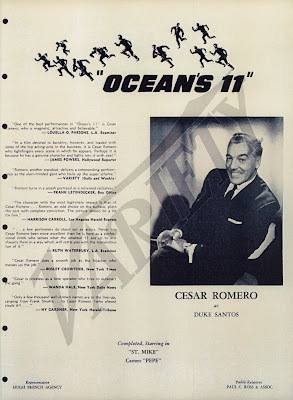 The guy what steals Ocean's 11 is Caesar Romero. He pretty much takes charge of the third act. Did Frank and company know or care about this Joker's heist? A group of five to whom I ran Ocean's 11 last week all agreed it was Romero's show from the robbery's finish on in. 1960 observers thought so too. Several polls place him in supporting Oscar nominee contention for Ocean's 11, observed Variety in December of that year. Caesar himself got out a trade ad to spread word of critic's approval (above). For my money, he's the cool cat in this show --- suave, unflappable and making most of scenes via commitment several times that of blasé Rat Packers. 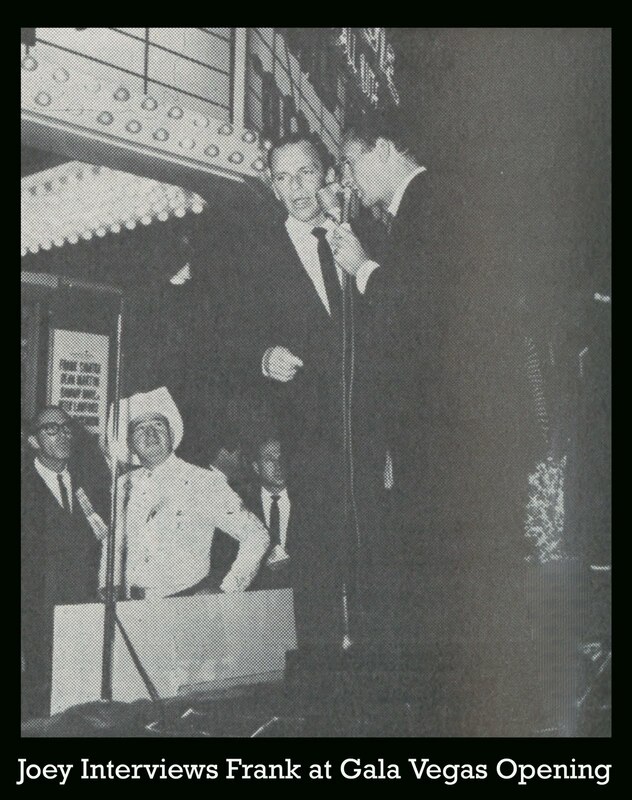 One scene Sinatra would undoubtedly have ordered reshot, had he noticed, shows CR entering a room and towering over the diminutive star. 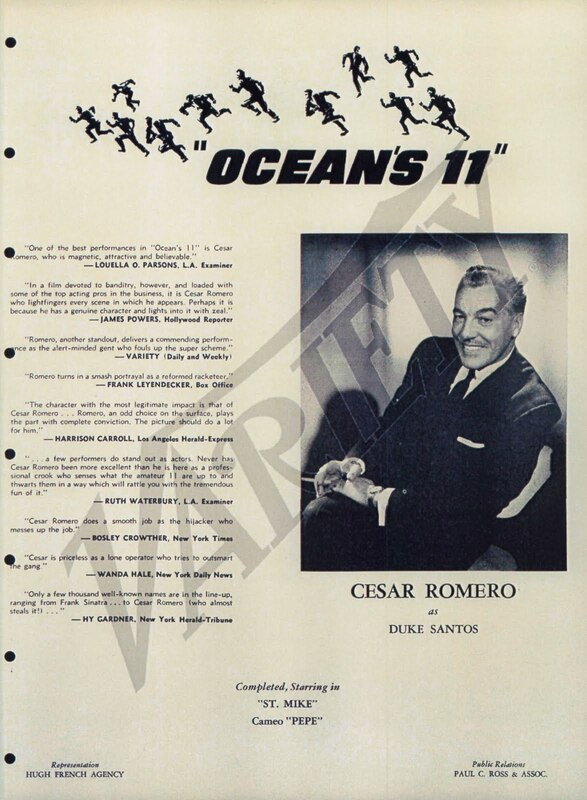 Did Romero get his lion's share of Ocean's 11 for showing up to work as opposed to oft-truant principal players? 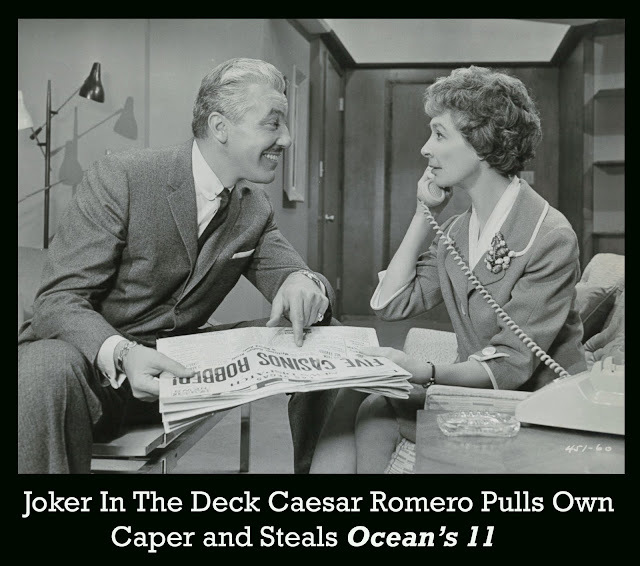 My viewing group came away from Ocean's 11 wishing he'd framed the caper ... maybe in that event it would have come off successfully. Some reshooting might have helped. 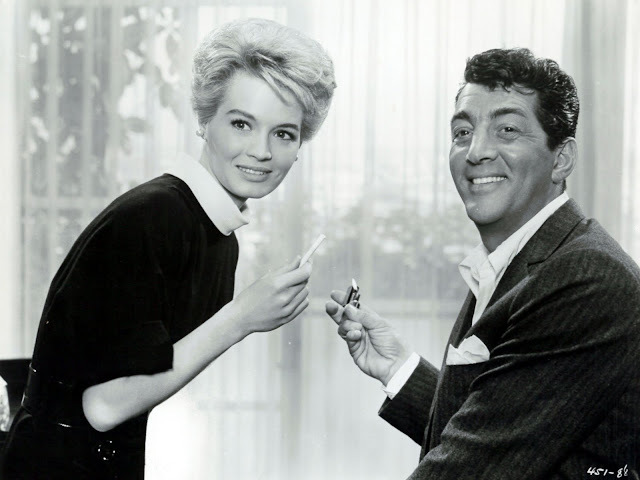 Peter Lawford prevailed upon Warners to fill in obvious holes, but they attended more to splashy premiere plans than squaring away a better movie. Power-less player Lawford would go along to get along, a sad fate for anyone in Sinatra's razzmatazz orbit. To his credit, though, Frank kicked in on selling side of O11, attending a June New York meet with director Lewis Milestone and WB execs to round out plans for an August grand open in Vegas. 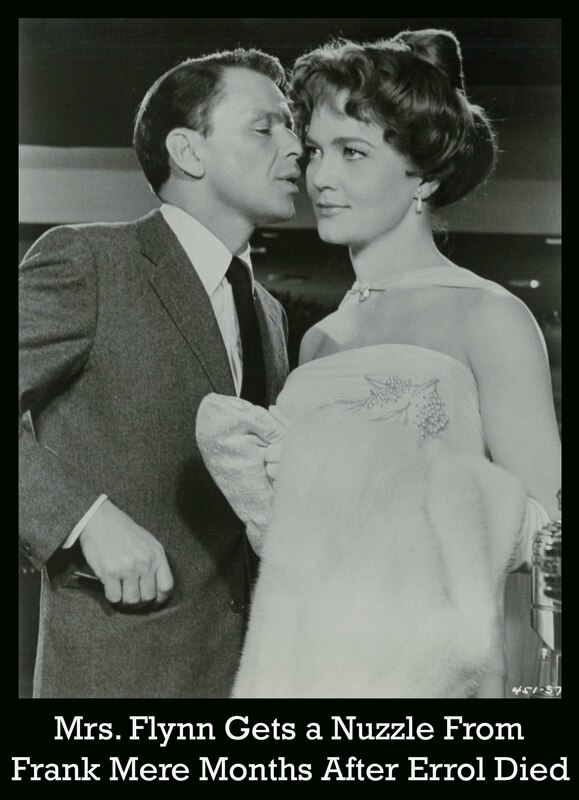 Sinatra liked the pic well enough to private preview it for John and Jackie Kennedy at his Palm Springs home. Spencer Tracy was also there ... wonder if Spence gave Frank an honest answer when asked how he liked the show. 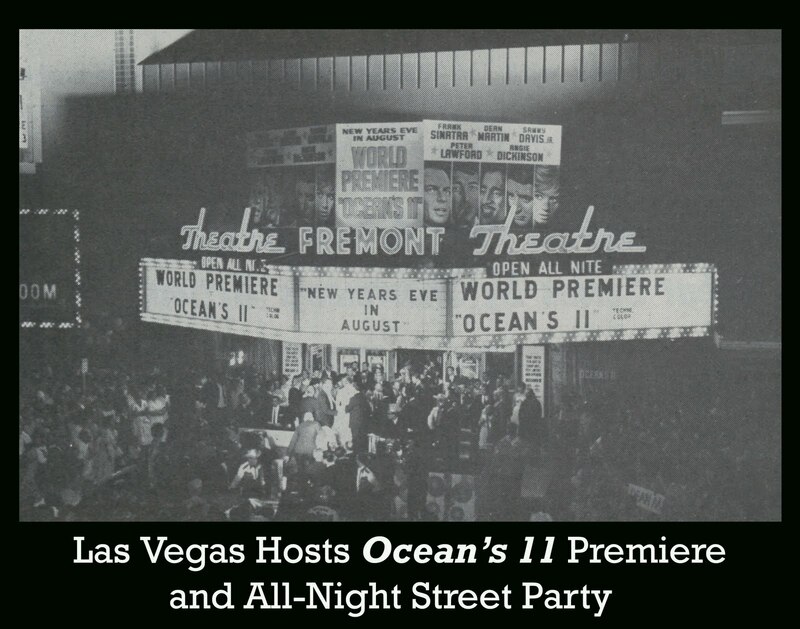 World Premiering at LV's Fremont Theatre was sure enough a blowout. Streets jammed, a parade up the Strip, celebrities near outnumbering civilians. Some of revels would turn up on Jack Parr's vid show later. A "summit meet" at the Sands preceding the open reunited the Pack and fired up WB's Steve Trilling to propose filming the act to send out as a follow-up concert feature. But where could it be shown?, asked Army Archerd: The boys rehearsed the material in the locker room, an indication of the tenor of the entertainment offered by the jolly boy's club. Lewis Milestone was ringside for the Sands party and premiering that followed. He'd afterward go on a twelve-city US tour to promote Ocean's 11. Whatever this director earned over a long career was doubtless dwarfed by percentage payday realized here. He'd later speak well of the film and Sinatra to historians. 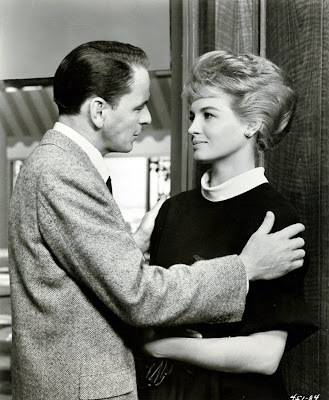 1960 showmen in for less loot felt Warners was working a caper of its own, as even neighborhood sub-runs were being hit up for 50% of receipts, a distributor grab in excess of Paramount's 35% demand for the same summer's Psycho. Erstwhile co-producer Peter Lawford, rich off those terms, shopped a biopic around on champ jockey Johnny Longden he'd worked on for several seasons, but ... no takers. His Thin Man TV series had wrapped and expulsion from the Pack would come later, thanks to contretemps with Frank that were in no way Peter's fault. 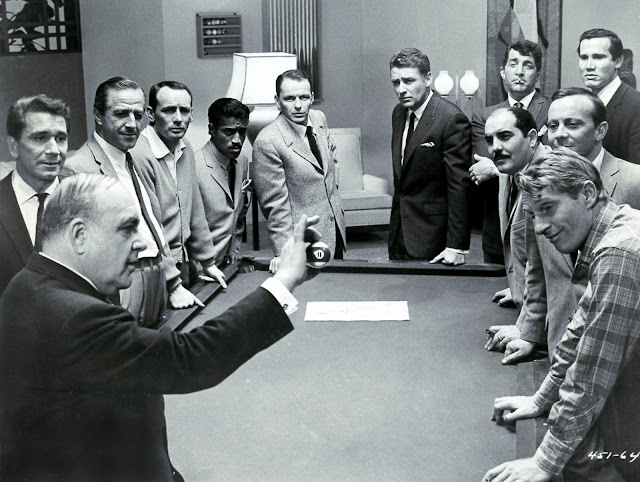 The Chairman himself looked back on Ocean's 11 as a "fun" movie and little more. He'd live long enough to see Rat Pack (a term he always despised) high-life celebrated anew by hipsters not yet born when the pic played new. Just the fact it moved up Warners' Blu-Ray release schedule makes clear O11's continuing hold on fans wishing its ring-a-ding world could live again as their own. Sub-runs had to pay 50% off the top?! Whoo-ee... do you know if this was reissued at popular prices before it was televised? I can just imagine some exhibitors in the smaller situations saying, "Forget it, let's book a Martin & Lewis oldie instead!" I saw those O11 premiere revels on the old Jack Paar show, and they were very funny. Thinking about it later, I realized the whole thing had to be a put-up job among the Rat Packers for the benefit of Paar's audience. For one thing, Joey Bishop, as the on-site correspondent, treated Sinatra in a way he would never have dared in real life if Frank hadn't been in on the gag: Frank would start to talk seriously about the movie -- "You see, Joey, some people think from the title that this is a war picture, but it's not. I play a guy named Danny Ocean..." -- at which point Bishop would cut him off and lunge at some approaching celebrity: "Excuse me, Frank. Here's Cesar Romero, ladies and gentlemen!" 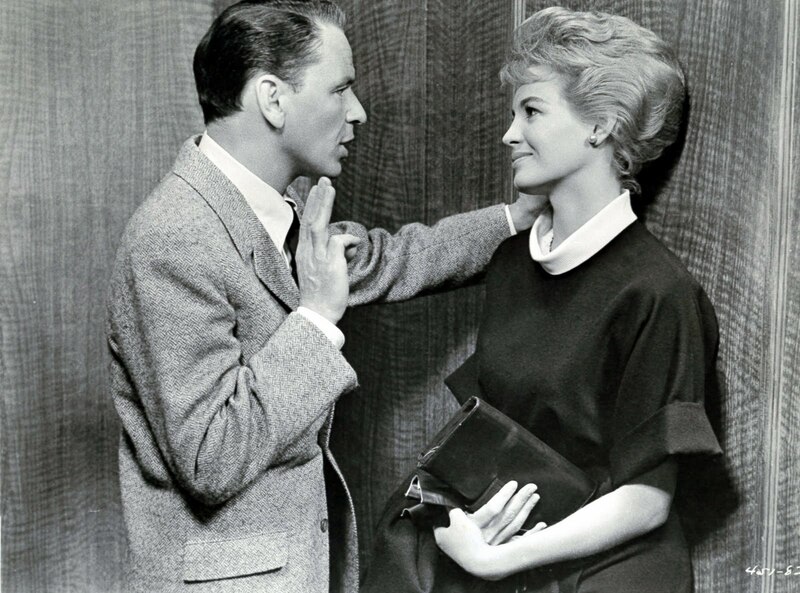 This went on for three or four times, with Frank finally becoming disgusted: "Aw, forget it, you snob; I wanted to talk to you but you're too busy kissin' up to your movie star pals..."
Bishop: Isn't it exciting, Dean, this world premiere of your new picture Ocean's 11? Martin [leering and bleary-eyed]: Y'mean this ain't Ben-Hur? 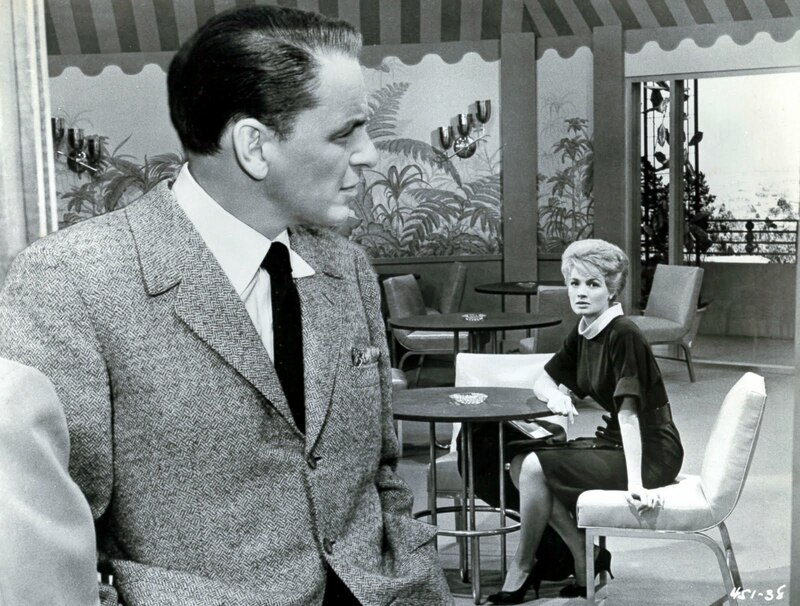 Lou, I've never seen "The Runaway," but it sure sounds interesting, what with Anita Page, of all people. Jim, Thanks A LOT for this eye-witness account of the "Ocean's 11" premiere segment on the Jack Parr Show. You have an incredible memory --- this was over 50 years ago!! I can almost bet the farm that no small town theatre or drive-in in North Carolina paid 50%film rental for this or virtually anything. Example: The hardtop where I worked refused to book GWTW during its 1967-68 reissue until Metro dropped the terms from 50% to 35%. And if they wouldn't pay 50% for GWTW, imagine OCEANS' chances. As for drive-ins, 25% tops for first outdoor run, then a flat rate for sub-runs. I used to see Raft frequently -- as he was hard to miss -- sitting in a showroom window (literally) on Wilshire Blvd. in Beverly Hills, which I think housed the Sands Hotel office, as I recall. I once asked Dad what he was doing there, Dad said he was a "Front/P.R. Man", I guess, taking reservations. Akim Tamiroff I used to also see once in a while, walking with his wife thru Beverly Hills. Never spoke directly, but would nod and smile. He seemed like a very nice man. This was not his first encounter with Milestone, as he had, of course, virtually co-starred in Milestone's "General Died at Dawn" in 1936. Mr. McElwee, it's officially been declared John McElwee week at ilovedinomartin with part uno of your extraordinary expose on O11 just put up at our humble little Dino-pad. Each day through Saturday ('cept for Friday when we will remember a special day in Dino-history) we will be sharin' more and more of your powerful prosin' in honor of our main man. 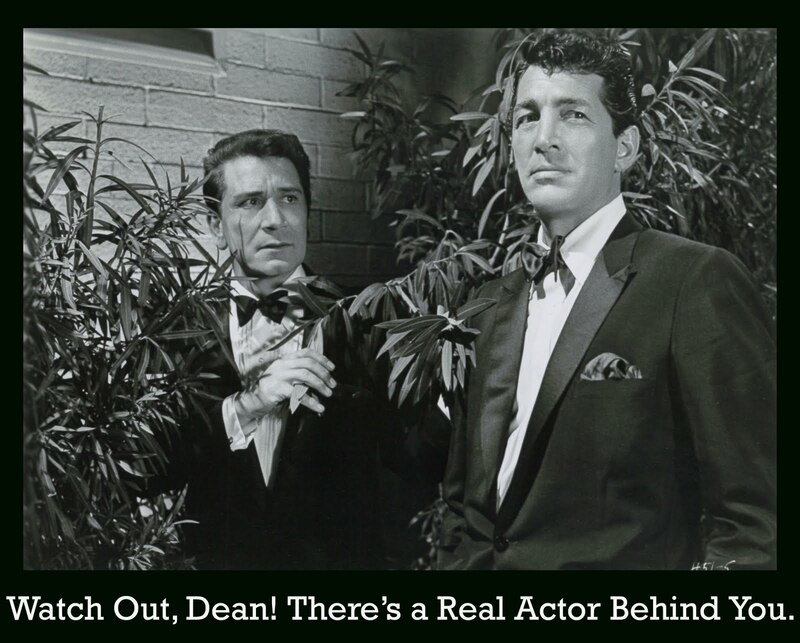 Likes as you sez, Dean Martin Forever! Mr. McElwee, your stunnin'ly scribed and fabulously focused Part 2 of O11 has just gone up at ilovedinomartin...you sure have an amazin' knowledge of cinema and a huge command of the English language...and most importantly you truly "get Martin."